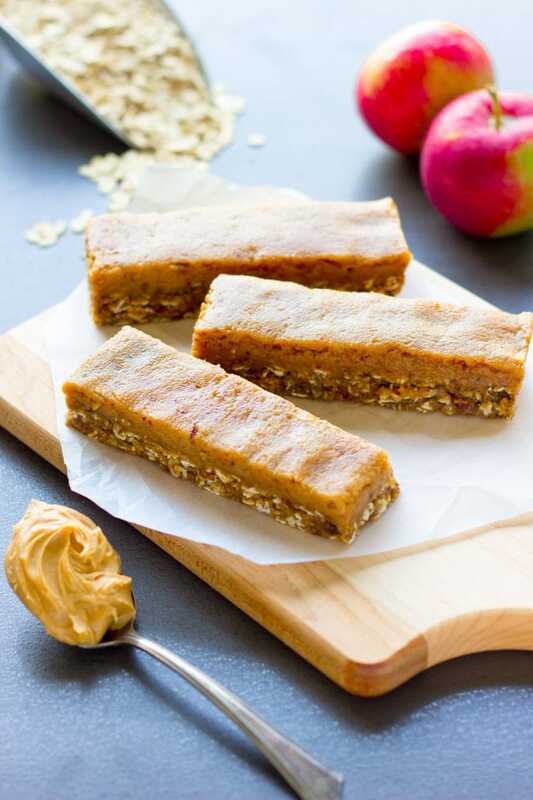 These delicious no-bake caramel apple pie protein bars are a must-try fall season treat. Easy to make and super healthy, they taste like your grandma’s caramel apple pie, without the calories, refined-sugar and all the bad stuff. 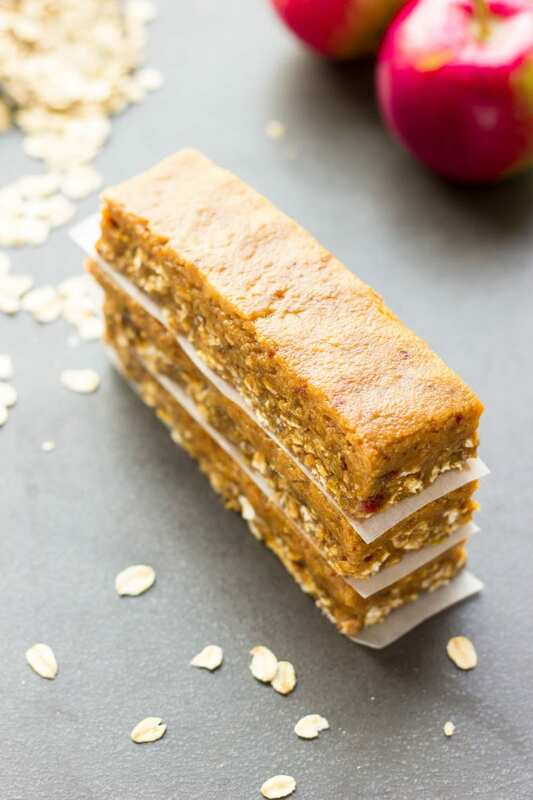 Raw, entirely gluten-free, vegan, dairy-free, egg-free, flourless and refined sugar-free, these delicious protein bars are the perfect breakfast, snack or post-workout treat! Yes friends. It’s fall again (What?! Already!). Don’t get me wrong. I LOVE fall. It’s just that summer is too damn short. Don’t you agree? Apple pie, pumpkin spice everything, stews of all sorts… Maybe it’s the weather, maybe it’s the days getting shorter. I don’t know, I can’t put my finger on it, but one thing I know: We DO love our comfort foods during fall. The caramel topping is optional for this recipe and it is totally up to you to make it or not, but I suggest you spend an additional 5 minutes in the kitchen and make it: It is absolutely delicious. 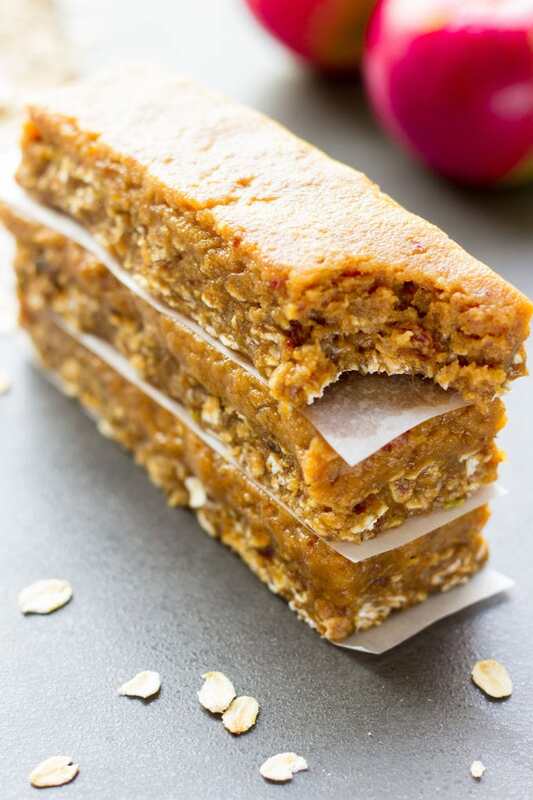 These caramel apple pie protein bars taste so much like apple pie that you’ll want to run to the freezer to grab some vanilla ice cream. That is how good they are. And did I tell you how healthy those are? 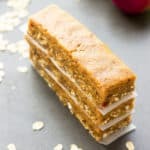 It always amazes me how easy it is to create delicious clean sweet recipes with all the excellent healthier ingredients/alternatives which are available pretty much everywhere nowadays. 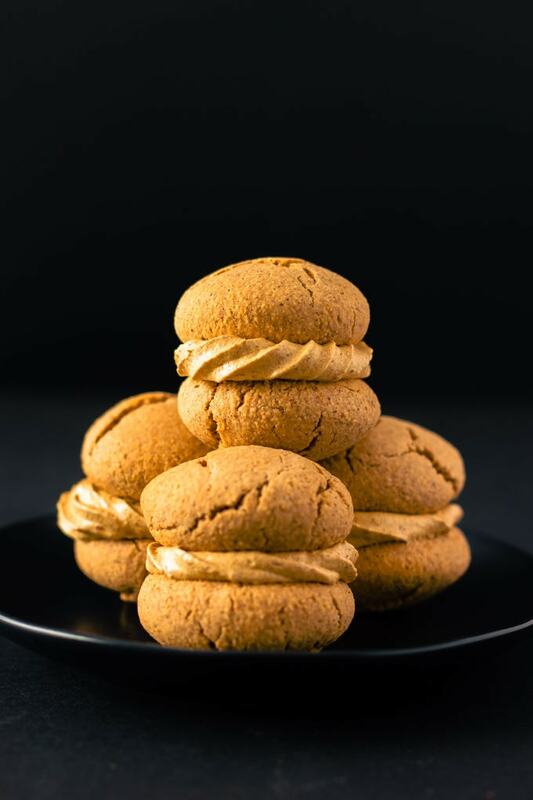 Gone are the days when you had to ingest processed foods of all sorts just to satisfy your sweet tooth. Hopefully, more and more people will stop using all-purpose flour and refined sugar, those are NOT needed for a good dessert/sweet recipe. Not anymore! Turn 1 cup rolled oats and 1/2 cup pitted dates into a fine flour using a food processor. Transfer the mixture to a large mixing bowl, incorporate the rest of the ingredients from the "Base" section and mix thoroughly with your hands. The dough should be very thick. Press the dough into your baking pan. Refrigerate for about 20-30 minutes. Meanwhile, process all of the ingredients from the "topping" section into a food processor. *Use plant-based for the vegan version. Reduce the amount of oat flour to 1/2 cup if doing so (1 1/2 cup rolled oats total). The amount of moisture absorbed by the protein powder used might differ slightly from brand to brand. If too moist, add more protein powder, if too dry, add more almond milk. The dough should be very thick as this is a no-bake recipe but still hold together. OMG! I just made these and they’re in the freezer setting now! I, of course, had to taste them each step of the way and they are amazing. I even made the caramel topping. My hubby is going to love them 🙂 . thanks so much for sharing your amazing recipe! Oh great, I’m glad you loved them!